Well, it is time to get rid of your bloated stomach; its time to get rid of that gaseous air in your belly and normalized your tummy with The 3 Day Detox Water for Stomach Bloating. There are a lot of causes for this widespread discomfort of the stomach, ranging from simply eating too much, eating and drinking at the same time, and going to bed or lying down immediately after a meal. It has been broadcasted on social media and from various studies that stomach bloating is affecting every age group: young, old and in between. Step 1. Wash cucumber, peel pineapple and remove eyes from it. Step 2. 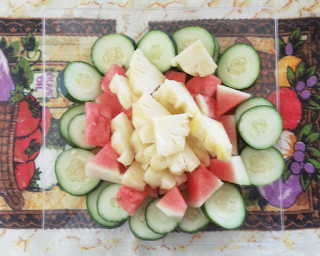 Dice watermelon into small pieces and cut cucumber and pineapple into small slices. Step 3. Add all the diced and sliced fruits into a large water bottle or container and place it into the cooler to sit for about 1 to 2 hours before you drink or let it sit overnight for maximum results. Start drinking this water from 6 A.M in the morning to 6 P.M in the evening. Note: Do not drink this water while you are having something to eat. Wait for 30 minutes to an hour before you start drinking it again. However, simply put, stomach bloating is the storage of gas within the digestive system that results in your stomach sticking out like a pouch on a kangaroo with a Joey inside. This is not supposed to be taken likely when certain abnormal symptoms occur that causes pain in the body. According to Medline Plus, some of the causes of bloating includes: Swallowing air, Constipation, Gastroesophageal reflux (GERD), Irritable bowel syndrome, Lactose intolerance, problems digesting other foods, Overeating, Small bowel bacterial overgrowth and Weight gain. 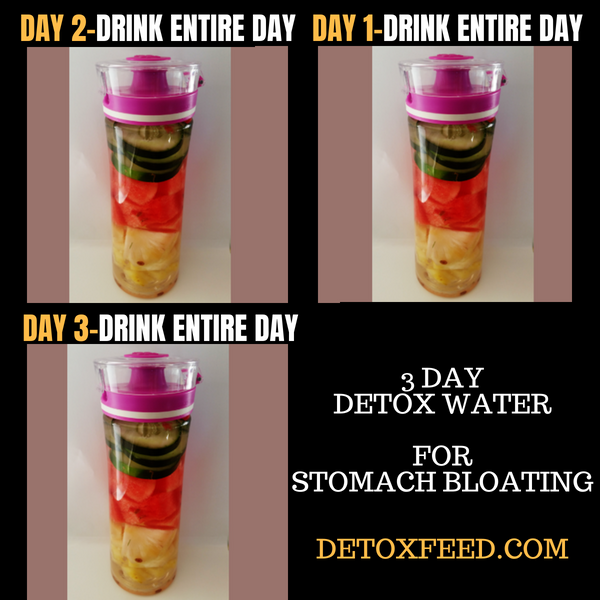 This might seem to be irreversible, but with this 3 Day Detox Water for Stomach Bloating and a change of your diet with God in the mix, all maladies contributing to your stomach bloating can be cured. 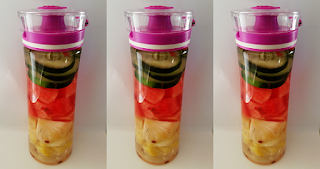 This Detox water is tasty, refreshing, easy to make and will help to reduce the bloating in your stomach.